When purchasing a data acquisition system, there are several factors to keep in mind. Practically any system – GPS-based or not – will record basic speed data and generate a track map, which will get you started and provide plenty of data for the novice rider to learn from. Most systems will, either as standard or through expansion, allow the addition of more sensors to allow you to collect more data. Racepak’s systems are expandable using the company’s V-Net technology, allowing dozens of sensors to be added. A basic Racepak G2X setup will record GPS information (including speed) as well as RPM as standard channels. Adding more channels can be an expensive proposition, requiring additional hardware that can soon get bulky as well. That said, the Racepak systems are practically infinitely expandable using the company’s V-Net technology. Other systems may offer more channels in their basic configuration, but have limited expansion capabilities. Several companies are offering small GPS receivers that work with a Pocket PC to provide data logging capabilities, and these systems offer the bare minimum of data with no expansion. When shopping for a logger, consider not only your current needs for sensors, but also what expansion you may need in the future. AiM Sports’ MyChron Light TG LOG system allows up to four channels using a junction box. The company’s MXL models provide up to four speed inputs and 12 extra analog inputs along with RPM. The next item to consider is sample rate, or how often the unit collects its data. This is expressed in terms of Hertz (Hz), or number of samples per second. A sample rate of 10 Hz means the unit takes a reading of the channel 10 times per second. 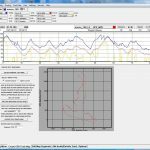 If you’re measuring only speed and rpm, a sample rate of 10 Hz is sufficient for your needs, as those values do not change significantly over that short a time span. Look at suspension, however, and 100 Hz or even more is necessary to see the whole picture. When considering a certain system, check the sample rate to ensure it’s sufficient for your needs. One more criteria is the amount of memory the system has. Obviously, the more channels you are sampling, the more memory you’ll need to store that information. And the longer your practice sessions or races are, the more memory you’ll need. As well, however, if you start recording data at a high sampling rate, the amount of memory required can jump exponentially. Some systems record the data onboard; others use a removable card for storage. Whatever method is used, be sure that the setup you are considering can store as much data as you’ll need, and don’t forget any channels you’ll want to add in the future. When researching a data acquisition system, it’s possible in most cases to download the software and some sample data before purchasing, so that you can be sure the software will satisfy your analysis needs. Finally, what may be the most important aspect is the software used to analyze the data. Luckily, most companies allow you to download the software and some sample data files so that you can evaluate the program before you buy. 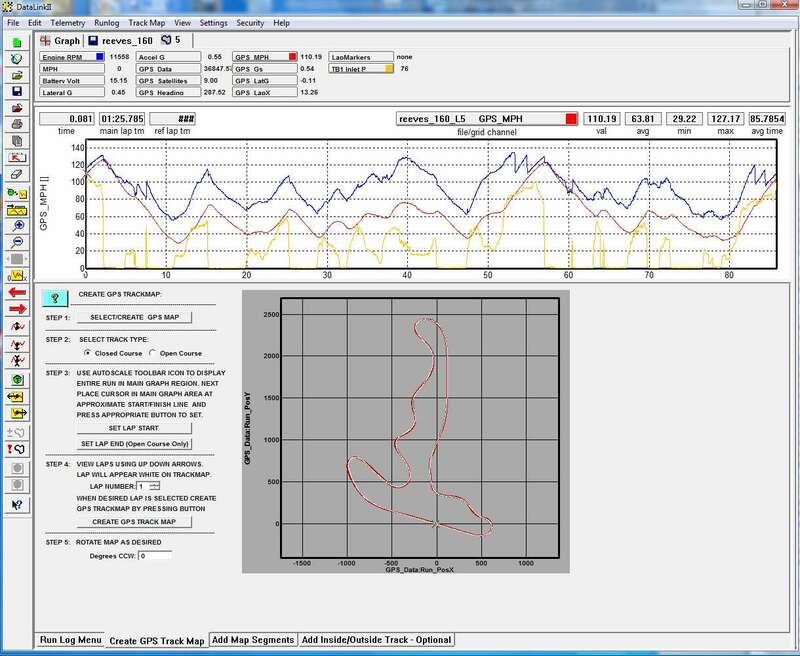 At a minimum, the software should: provide the capability of generating a track map and dividing it into segments; allow you to overlay data from two different laps for comparison purposes; and allow the creation of math channels that let you further evaluate the collected data.